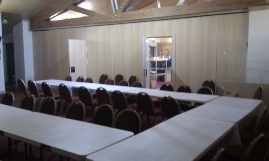 Allerton Shul has a comfortable Function / Meeting Hall and Kosher kitchen available for hire. We already host the monthly Wednesday Lunch Club arranged by Merseyside Jewish Community Care which attracts 60 - 80 people each month. Talks to schools are also given in the Synagogue and hall. The hall is available for wedding & bar/bat-mitzvah receptions, meetings, lectures etc. There are long and round tables and comfortable plush chairs that come with it. Please contact the Synagogue Office for more details.